As you’re looking out at your backyard, you probably have projects you can’t wait to bring to life to create the yard of your dreams. But the thought of doing them yourself is overwhelming, and let’s face it, pretty much impossible. That shouldn’t keep you from relaxing and entertaining in a yard that makes you proud. Our team at Exotic Garden Landscaping has been making backyard dreams come true for years, and we can help bring your vision to life. We believe everyone should enjoy the outdoors as much as we do, and we can help you get there no matter what your starting point currently is. Call us anytime for an on-site consultation with one of San Jose’s premier landscape designers today. When you think about your backyard outdoor space, we want you to get excited about spending time out there relaxing and entertaining in the beautiful California weather. Since we all have different ideas about a dreamy outdoor space, our team will sit down with you and listen to your needs and desires concerning the space. We love doing projects of any size or complexity – from beautiful backyard living spaces to complex, gorgeous outdoor kitchens – we’ve done it all. We also really enjoy bringing your wildest dreams to life. 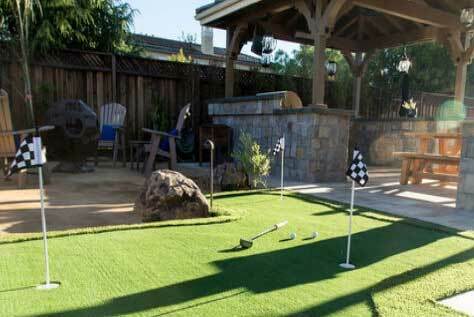 Want a putting green in your backyard so you can practice your swing or have friendly games with the family? No problem, we can do it. 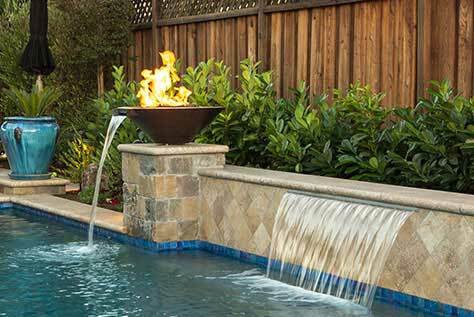 How about combining water and fire to dramatically accent your atmosphere? We’ve got you covered. 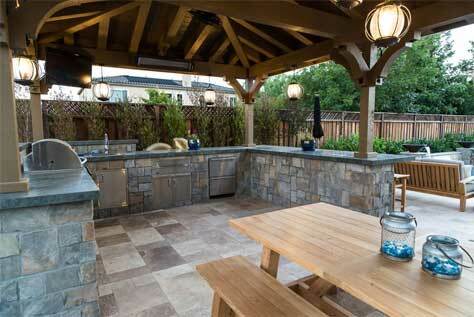 Or maybe an outdoor kitchen that looks like it belongs in a magazine is more your style? 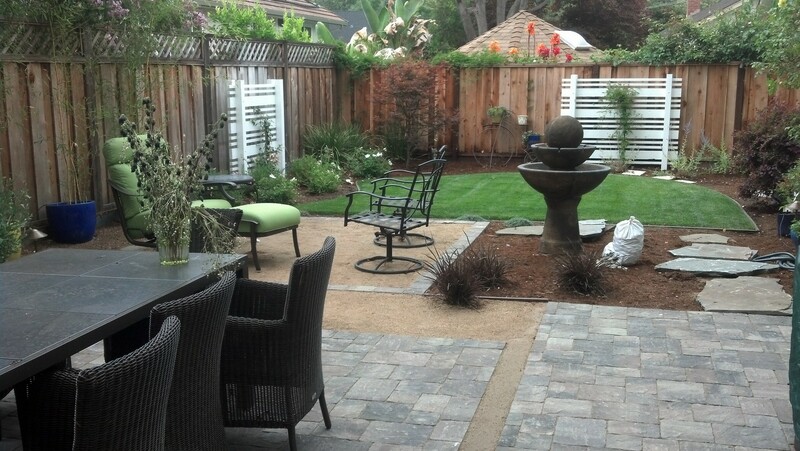 We want you to view your backyard as a land of opportunity to create a space you’ve only dreamed of before because you’re working with the best landscape designers in San Jose. What makes us the best? Our approach. When you hire Exotic Gardens Landscaping for your landscape design project, you’re getting decades of experience as well as a passion and love of the outdoors that runs deep. When 40 years of hands-on outdoor and landscaping experience meets a brilliant landscape design architect, amazing things happen and that’s exactly what we offer. Quality craftsmanship and materials to create a lasting and durable backyard design. Hands-on attention from our entire team to make sure you get exactly what you need. An eye for detail that leads to a functional, gorgeous outdoor space you’ll love. Full attention on you because we only take on 1 client at a time – you deserve our best and that’s exactly what you’ll get. A team of in-house contractors that are trained and experienced in creating elegant outdoor spaces. A network of trusted specialized contractors we bring in to complete jobs required certain skillsets, such as pool installation – you won’t have to find these crews and manage them yourself. A team with a vision and the experience to execute. We help you plan your space, then we design it and execute that vision to the very last detail. You could hire multiple companies to accomplish all of the jobs we do in one design and landscaping project. But why go through that trouble and spend all of that extra money? We have the experts you need in-house and when we don’t, we have a trusted list we contact and manage on your behalf without charging you a bit more. We love working in San Jose because it has a certain appeal you just can’t miss. From its culture to its history, there’s always something beautiful to look at and fun to do. San Jose enjoys beautiful California weather, with an average of 257 sunny days each year. You can expect around 17 inches of rainfall during the year. The average high in the hottest month of the year, July, is around 83 degrees. The coldest month, January, sees average lows around 40 degrees. There are plants that will do well in the San Jose weather and plants you want to avoid if you want to create a beautiful outdoor space. Plants that are native to the area are great choices. In the areas you want to incorporate plants and greenery, our team can help you choose what plants will thrive and do well. We’ll also discuss with you the maintenance needs you’ll want to consider and what plants work well together without being invasive. Happy #FirstDayofSpring! Our gardens have spring with lively greenery, and ready for you to stroll through on a beautiful day such as today! If you’re not sure if we’re in your neighborhood, just give us a call. When it comes to creating your dream backyard and bringing your vision to life, you want to work with only the best, experienced professionals to make the process enjoyable and easy. Our team is here for you every step of the way, from the first planning to following up after the design has been executed to make sure everything is working well. Contact us today to learn more about our San Jose landscape design and landscaping services to get one step closer to the backyard of your dreams.